Lexus partnered with streetwear designer John Elliott to create custom tires for the Lexus UX compact crossover. The “Sole of the UX” tires are inspired by the John Elliott x Nike AF1 shoe. 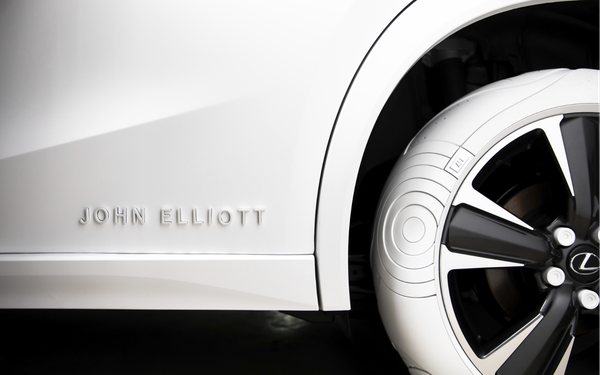 “The tires reimagine the classic silhouette of Elliott’s sneaker, embodying the spirit of clean, purposeful, and modern design,” according to the luxury automaker. Team One and IMG facilitated the collaboration. The tires, like the crossover, are inspired by and designed for the city, said Lisa Materazzo, Lexus vice president of marketing. “We wanted to push that concept even further by creating the ultimate homage to urban style: tires inspired by classic, street-style sneakers,” she stated. Revealed at Elliott’s New York Fashion Week after-party on Feb. 9, “Sole of the UX” will make additional appearances throughout the country later this year. The collaboration features an all-white UX with custom tire details inspired by Elliott’s design, including white on white layers, double-stitched leather and a stepped metal air valve evocative of his stacked metal lace tip. “It’s fun to partner with brands that typically live outside the fashion community because it allows us to evolve and continue to push our own boundaries,” stated John Elliott. At the event, Elliott showcased unique iterations of the John Elliott x Nike AF1 by artists Actual Source, Hassan Rahim, Matt McCormick, and Yung Jake. These one-of-a-kind sneakers were auctioned off at the event with all proceeds benefiting Inner-City Arts, an organization based in downtown Los Angeles with a mission to provide access to arts education for LA youth. Lexus was the official automotive partner of NFYW for its eighth and last consecutive season. The automaker will continue to seek cohesive collaborations in creative communities and beyond, according to a spokesperson.